1998 was a good year for hair, but a bad year for fashion. I remember seeing some ‘cigarette pants’ that year (not the cute cropped kind, the ones that go all the way down to the ankle). Shiny ones. (Yeah, I know.) I don’t want to talk about that though. 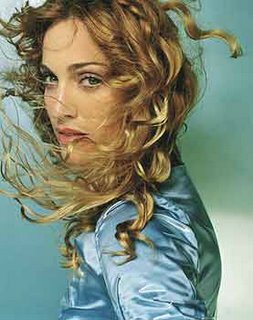 Madonna’s hair in particular looked great that year. It was my favorite hairstyle of hers. Not like this new ‘Farrah during her Charlies Angels’ days style Madge is sportin now. But what does she care? She probably doesn’t give a ‘whatever’ to what anyone thinks of her hair (or anything else). She close to 50, in (oh my god) fantastic shape. And over the last 25 years, has been criticized by everyone from her parents to politicians to da Pope to Letterman (not in any particular order). So, she can do whatever she wants & that’s fine. She wants to sport the same feathered hairdon’t Bon Jovi’s got (& had for years), she can do what she wants. That’s a pic of her to the right (duh). It’s actually one of my faves (along with the inside cover of the Spin mag she did that same year; w/ her face w/ eyes open superimposed on her face w/ her eyes closed. That was an incredible pic, but I don’t know who did it. I have that issue still at home, but don’t want to dig it out of whatever box it’s in.) But this is the famous portrait of her that Mario Testino did & is now found at the National Portrait Gallery. But one huge (& horrendous) thing that happened in fashion back in ’98 (and the whole point of this story) was “the shrug”. I have no idea where it came from (or why). It just happened & I hated it, and I waited a whole year to see it disappear. Ya know those glass things that Superman’s dad put those 3 bad guys in, then sent them into outer space in the 1st superman. I feel like that’s what happened with the shrugs. The went away, and everyone was happy again. No one could believe that ppl had wore them by choice. Well, now (somehow) they’ve come back. & ppl are acting like they don’t remember 1998, when they were here & horrible. 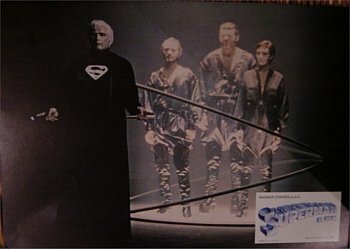 Just like how the 3 bad guys in the 1st Superman movie came back years later to another planet & no one knew how evil they were. Shrugs are just like those bad guys. I think we have to come up with a way to rid the world of them for good. Or, the same cycle will happen again. Ppl will come to their senses, and then years from now, they’ll be back again. I just don’t get it. It’s not like they cover you up, or keep you warm. Remember shoulder-pads? You don’t want them back either, do you? While we are getting rid of stuff, I also detest these ‘metallic bags’ that are coming back. And who told anyone that Sienna Miller should be a fashion icon. Does anyone really respect any of her choices? She is single-handedly responsible for bringing the ‘hobo bags’ back. That doesn’t work for me either. lookin for something specific I wrote about? All content on Looking for Sunshine & Sweet Sunshower, unless otherwise noted, is licensed under a Creative Commons Attribution-Noncommercial-No Derivative Works 3.0 United States License. shwetasheel on Christmas is here.